Women only Brazilian jiu jitsu classes on Wednesdays from 18:40-19:40 at 7 Easton Road with Lisa. FREE for your first week! What: Brazilian jiu-jitsu is a martial art that grew out of judo. It emphasises defending yourself on the ground, specifically how to reach a controlling position, then finishing with a choke or joint lock. When: Every Wednesday from 18:40 through to 19:40 at our central location in 7 Easton Road (the entrance is between LA Gym and LA Combat, there are specific directions with photos on our locations page). The women’s changing room is next to the mat, there are also showers in the kickboxing room next door. Why: The intention is to give women a chance to try out BJJ in as supportive and encouraging an environment as possible. They can then feel confident about joining the mixed BJJ classes further down the line. No experience necessary, so complete beginners are very welcome! Read testimonials here and all our women-focused news posts here. So, if you’re a woman who has ever wanted to try out BJJ and/or learn some practical self defence skills, now is your chance! We will be looking at core BJJ techniques, in order to introduce you to the most effective and widely applicable parts of Brazilian jiu jitsu. How: Classes are taught by Lisa (with help from Kirsty and Jade: more info about all of them over on the instructor page). In terms of what to wear, if you already have a gi from previous training, that’s ideal, but it is also totally fine to start with a t-shirt and some jogging bottoms, shorts or leggings. Whatever you choose to wear, make sure that there aren’t any zips or pockets. Similarly, don’t wear jewellery and tie back long hair. Removing make-up before class would be advisable too, as due to the nature of grappling, that is likely to get on your training partner’s clothes. Where: The gym is located in the 7 Easton Road building, in between LA Gym and LA Combat. There is a map and directions here (please take a look at the photos, the entrance is easy to miss  ). We hope to welcome you onto the mats soon! If you’re looking for some inspiration, check out the testimonials from Kirsty and Tracey. There are also several videos you might find helpful. The women of Kimonoworld talk about what BJJ means to them here. Kendra Jones has an excellent video exploring the women’s class at her school here. Finally, this popular video from Ocean County BJJ provides another perspective on the importance of jiu jitsu for women. You could also listen to this episode of the Fightworks Podcast, all about women. 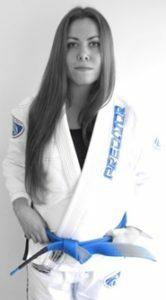 There is further reading on the excellent Grapplearts website, here, here and here, along with Fenom Kimonos’ interview with Kristine. Finally, Mike Calimbas wrote a great piece on women training BJJ in Texas, with numerous contributions from the women he discusses.